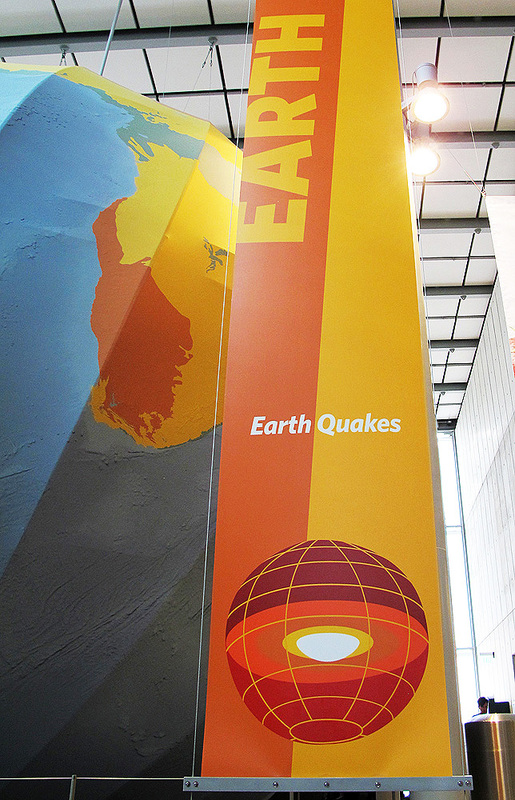 The California Academy of Sciences’ Earthquake exhibit and the graphics I created for it are now on view. The main illustration, shown above, appears primarily on merchandise for sale at the museum’s three retail stores. A related series of display signage icons for the exhibition space serve to identify the show’s four thematic areas: Life Drifts, San Francisco Shakes, Earth Quakes, and People Prepare. The Life Drifts section explains how the prehistoric break-up of landmasses affected the evolution and spread of life forms across the planet. 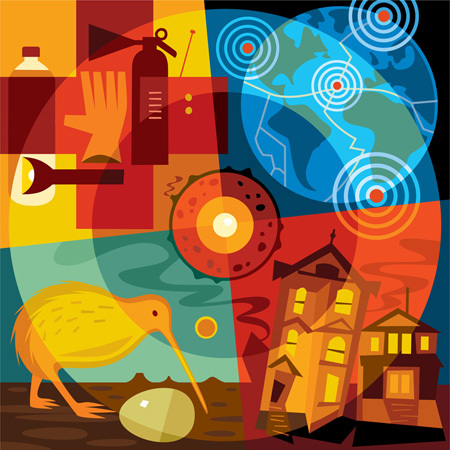 My illustrated kiwi bird is an example of species whose closest relatives are scattered in continents thousands of miles apart, having evolved from a common ancestor that lived when all the southern continents were connected. 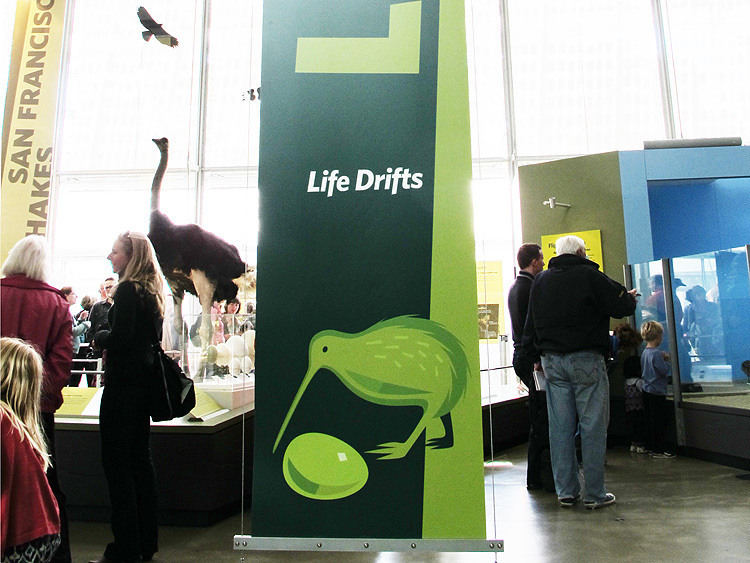 There are live baby ostriches in this exhibit area that also illustrate the shared legacy of India, Antarctica, Australia, South America, and Africa, which were once joined as Gondwana. 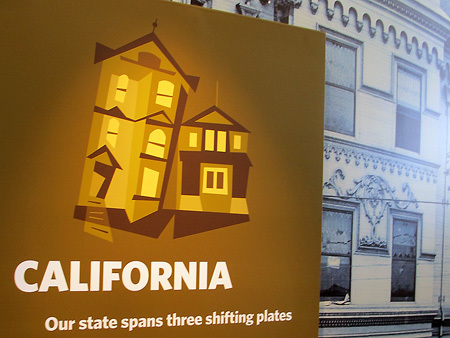 The San Francisco Shakes section features an earthquake simulator designed to look like an old Victorian home in San Francisco. Inside, guests experience the sustained tremors of the city’s two biggest quakes, the 6.9–magnitude Loma Prieta earthquake of 1989 and the 7.9–magnitude Great San Francisco quake of 1906. My illustration is inspired by this 1906 scene on Howard Street — the street my studio happens to be situated on. The Earth Quakes area features the ‘Walk-through Earth’ — a 25-foot-diameter model of the planet’s interior that visitors enter through an oversized crack in the globe’s crust. Inside are touchable geology specimens and interactive stations explaining the basics of plate tectonics. My graphic icon references the display’s architecture, fashioned after the Earth’s inner structure. 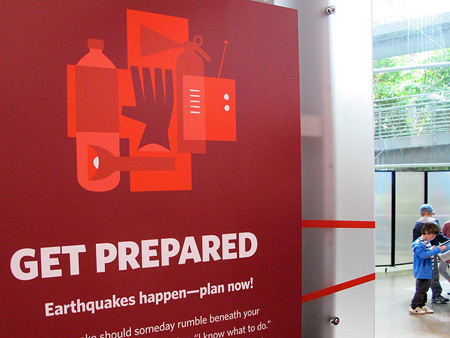 The People Prepare section addresses what to do before, during, and after an earthquake. The illustration emphasizes the importance of maintaining an emergency kit as part of home preparedness. 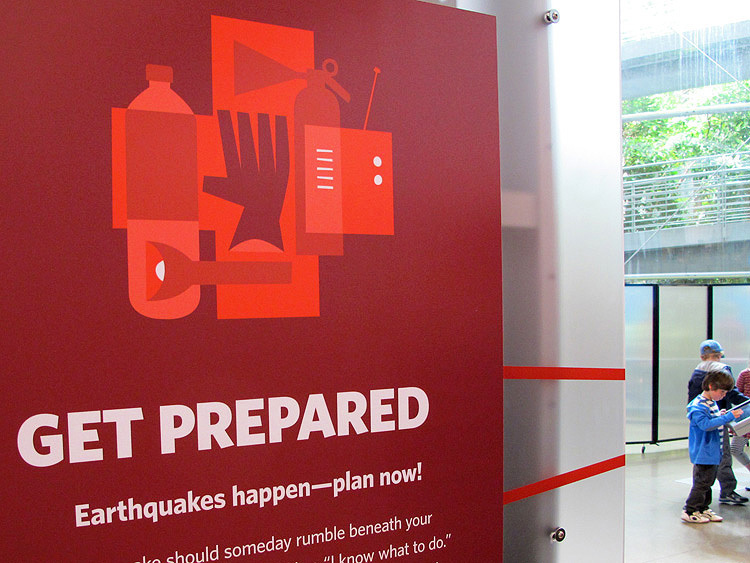 The final section of the exhibit includes a resource station offering preparedness advice from the CalAcademy and partner organizations. A set of icons was designed specifically for this space and for free booklets with tips on dealing with the next big quake. Many thanks for this commission to creative director Rhonda Rubinstein who I also had the pleasure of working with on the original theme illustrations for the Academy’s wall panels and print collateral. I’m thrilled that our previous collaborations continue to be featured on apparel and merchandise in the museum’s retail shops. The California Academy of Sciences is located in Golden Gate Park, San Francisco. Visitor information can be found here.